The Falcons handed out their post-season basketball awards Sunday night. There's no MVP, but rather a lot of awards that emphasize the team aspect of Orr-Ball, and reward players for contributing to that. Nice recognition of our three seniors, who have really contributed to our program from the beginning of their career to the end. Note Marc Larson's near 4.0. Very impressive. Also, note recognition of Scott Thomas, who I think is going to be a very good player. I love how some of the awards are named after Falcon greats, which is a great way to let Falcon players and fans know about the terrific basketball players who have been in this program. And, I hope, it helps them feel a greater connection with the program and help encourage them to be involved. The Spring Prospectus is out for the football team, always a happy day for any healthy, obsessed member of the Falcon Nation. There isn't a whole lot of info that's new...we don't even have a spring two-deep to use for uninformed speculation. A couple of notes. I compared the roster to the roster we had when we had when we took the field against Toledo, and, given that we had a new Coach, we didn't lose very many players over the winter. Fans who recall the Meyer Exodus will be pleased at this. The only letterwinner who is not listed on the Spring Roster is LB Josh Sheidler of Stow, who would have been a R-JR. He wasn't on the two-deep last year. Also not listed were Derrick Coker, JJ Laseak and Micheal Long, each of whom were walk-ons. Finally (hat tip to Warthog at azz.com), Eric Ransom is listed on the roster, with his class noted as TBA. That would seem to indicate that he is applying for a final year of eligibility. I don't know much about Eric Ransom, and sadly we haven't seen him play as much as we would have hoped, but his desire to play football through all these injuries is pretty impressive. Obviously, if he is able to contribute (even for limited plays) it would be a big lift for our football team. So, just to do it, I ran the numbers one more time. We're talking only conference games here, and what we find is that MAC scoring fell from 65.95 points per game to 61.17, slightly down from midseason. That's a 7.8% reduction from one year to the next. I hear such things are cyclical. And, I do understand that high scoring is not, by definition, better than low scoring basketball. It all depends though...is the low scoring due to good defense or merely low wattage offense. I don't have any data (short of a lack of true offensive stars in the conference), but I think the blend is uncomfortably toward the latter. By a pretty overwhelming amount, the students of BGSU approved, via referendum, the use of student fees to fund part of the Stroh Center. I think this is a very gratifying decision. Like any electorate, the students had the power to act in their self-interest, to take our frustration against the University, yield to their emotions and think in a short-sighted manner. Instead, they thought long term and about leaving a legacy to BGSU. They thought about self-sacrifice and looked at the big picture. Congratulations to them. It is a great day to be a Falcon. Basketball attendance was a pretty big issue this year, especially with the Blade running an article about the low attendance. It certainly is an issue. The fan base lost touch with the basketball program sometime about when Ron Lewis left (not implying cause and effect, just saying that was about when) . Prior to that, going to the basketball games was just something people did, students and community alike. Obviously that isn't how it is now. There is still a die-hard fan base, but parts of the Arena that used to be filled with regulars are now empty. If you are curious, here is the attendance over the last four years. So, while attendance creeped up into the area where it was a couple years ago, we're pretty much playing around on the bottom margins here. There's a lot of room for growth. Winning will help. Our last few games were over 2,000 in attendance, which is an improvement. As more people are in the arena, that will help to create the electric atmosphere we all love, and that reinforces itself and brings more people in. We are hampered by one thing....while we are playing winning basketball, it is not exciting basketball, and we do not have a star player that has the charisma to draw people into the arena. That is an obstacle, but I think it can be overcome, perhaps by developing an identity for the fans, like "The Rock" where the fans become part of our impenetrable defense. I'm hoping continued progress will help to bring around this aspect of our program. It would be a great thing to bring the Roar back to the house. The football schedule has been released, and for all the wailing and gnashing of teeth that has accompanied this event in the past, I think Falcon fans have to admit today that this is a pretty good schedule. I know...it isn't perfect. Most notably, there are no Saturday games after late October, a long-standing issue. Beyond that, however, I think we have to think that this is the best we have done in years in terms of Doyt games. We are playing six games on our home field. I don't believe we have ever scheduled six games here, and the year the MAC Championship game was here might have been the only year it ever happened. We have Boise coming to our stadium. Boise the signature mid-major program in the country, and it is a great coup to have them in our place. We also have Troy coming. While not a marquee program, they play a very tough schedule and are regularly in bowl games. It should be a nice test for our new Coach in his first game. We have Toledo at home. We will also have Dan Lefevour coming to town. We have quality road games against Missouri and Marshall. We open the season at home, something I think is very important. So, I guess nothing beyond this...kudos to everyone who worked on this. I cannot wait to get to the Doyt this Fall. Spring practice started today. The Clawson era has begun. Tues., Nov. 3 --- at Buffalo (ESPN2), 7 p.m. Thurs., Nov. 12 --- at Miami (ESPNU), 6 p.m.
Fri., Nov. 20 --- vs. Akron (ESPNU) 5:30 p.m.
First, the final additions to the football staff have been announced. First, Mark Carney will coach WRs. He is a Cleveland native who played for Clawson at Fordham and coached for Clawson at Richmond. He helped bring along Stacey Tutt, who is now in the NFL. (I don't mind any of these Richmond guys coming on board, because Richmond had a killer offense, and I hope they can do the same thing here). Second, Mark Elko will be the co-defensive coordinator and Coach LBs. Also from Richmond, he is the player who departure from TN-Chattanooga apparently irked the Coach there, who also came from Richmond. (I think I have heard more about the Richmond football since December than in the rest of my life combined. Otherwise, I do remeber hearing about a train going there, and it fell, and that's a time I remember, oh so well). Third, Mark Sheier will coach TEs and Special teams. Fans would always prefer that special teams have their own coach--and not without some reason in our case--but TE isn't too big a position, so I think its probably OK. He is a special teams specialist who comes from Lehigh and was at Princeton before that. He is also an Ivy League graduate (Dartmouth). Is it possible there are more Ivy League graduates on the football staff than on the faculty? Anyway, Jack Carle of the Sentinel had a spring practice preview article...here's are the key points, read the whole thing here. We could have been a great team last year but we didn't do the little things right. We need to develop mental toughness. (Solid if not original strategy). There is no depth chart. (Uh, OK. I don't buy it, but that's probably a symbolic point to make). Michael Ream was a beast over the winter. Brady Minturn will not participate in contact. Brown and Mahone are the key players on defense. Starters will play on special teams....check this quote out. "You've got to put our best open-space and in-space athletes on those teams. If a guy needs a play off, I would much rather they take a play off on offense or defense than on the special teams." And the Falcon Nation oozes into a soft, warm place of contentment. That, of course, is Ay-Ziggy-zoomba to the ears of those of us who have watched the team give away too many games due to bad to lousy special teams. Well, the NCAA made a big deal about moving the three point line back a little bit. And the effect on college basketball--minimal, if any. The most telling statistic--42% of the teams in D1 shot better under the new line than under the old line. Obviously, 57% got worse, but you could have had these numbers if you had kept the same line. Overall, the national percentage of made three-pointers fell less than one percent. Teams also tried about one 3-pointer less per game. With shooters the way they are, if you are going to impact 3-point shooting, you are going to have to do some serious moving. OK, it is time to review the season statistically for the Falcons. All year, I have been following the season looking at tempo-free stats...which means you look at points per possession and not total points. First, you estimate the number of possessions and then use total points scored to determine points per possession. This becomes the driver of the entire thing. If you want more on this concept, you can read here. I am a big fan. Now, let's see what we find. Please note that I am using MAC-Only statistics. It just makes things cleaner, and I believe that this is the relevant comparison. How we compete against the MAC is our real test. First, the real driver....points per possession. Two important things are going on here. First, our scoring improved .05 points per possession, which is about a 5% increase in a conference where scoring was down overall. This is not insignificant and works out to about 3 points per game (we had about 62 possessions per game). More important, however, is the stunning increase in defensive productivity. We went from pretty modest defensive production to very strong defense, a .11 point per possession reduction. And, of course, we went from a team that scored less than it allowed to a team that was in positive territory on points--as you would expect on a team that had a winning record. Now, let's see if we can see what happened. First, offense. And the answer is, there isn't much difference, right. We improved our turnovers about 3%, which nets about two additional shooting possessions per game. When we got a shot off, we scored 1.15 points per possession, so two turnovers less is worth a couple of points. Beyond that, offensive rebounding and free throws were pretty consistent from year to year. So, turnovers help the offense, and the increase was modest overall, but it does sort of feel like there should be another explanation. Maybe, oddly, the answer is on defense. Let's look. First, we see a nice decrease in effective field goals and a dramatic improvement in rebounds. Turnovers and free throws were very similar. And, here is where I think the answer lies. First, it is entirely possible that the improvement in rebounding was behind the reduction in FG%. Offensive rebounds often lead to high percentage second chance shots. So, by clearing the boards effectively, we prevent made shots and scoring. On top of that, Coach Orr often says that you start your offense on defense. I have no numbers to support it, but it seems very possible to me that we are more effective off stops than we are off made baskets (even though we rarely got a transition basket). With that in mind, I think that defensive rebounding, was the key factor in our team playing better basketball in the MAC this year. Overall, I thought we would be 18-11. Not counting post-season or the bracket buster, we were 18-11. So, that's not too bad. And, I thought we would be 10-6 and we were 11-5. So, that's not too bad, either. Of course, when you pick like that, the changes cancel each other out. Let's get to the real numbers....on a game by game basis, I got 21 right and 8 wrong. You know, that's not nearly as humbling as it usually is! And, you three of those were games (Savannah, C.Ark, and EMU) that it was a real shame we didn't win. Howard "Butch" Komives, a truly great Falcon player, passed away yesterday at the age of 67. His obituary is in The Blade. Contemporary fans may not appreciate just how great Komives was. He averaged--yes, I said averaged--37 points a game, in the pre-shot clock/pre-three point era. Even with those things added, it is hard to imagine a player scoring that many points today. (Teammate Tom Baker says he thinks Komives would have scored 45 points a game today). We were 40-12 during his last two seasons, appearing in the NCAA Tournament in both seasons. "He was a great guy and a tough competitor," said Nate Thurmond, a former NBA great and Mr. Komives' teammate at BGSU. "He was the kind of guy who would do anything for a friend." Mr. Thurmond, who lives in San Francisco, said Mr. Komives was a rare player because he possessed both offensive and defensive skills. "He was a great shooter. He played both ends of the court," he said. "A guy who scores a lot of points many times was never thought of being able to play the other end. But he played both ends. You don't see a lot of that." He also played four years in the NBA. Condolences to his family and all who knew him. He exhibited the virtues of hard work and committment, and in that way, is a role model for us all. He was probably the best offensive player ever to wear the orange and brown. Congrats for a first round WNIT win....apparently a second home game is in the offing. For a while, I have tracked our hoops recruiting because I contended that the current malaise of our program is the severe shortage of quality players we have brought in and/or kept since Dan's little trip to WVU. Now, my goal is to keep an eye on where our players are coming from, as well as to document how Coach Orr changes the fortunes. A couple observations. That 05-06 class is very interesting. It was a huge class, and at the time was kind of viewed as an opportunity to reboot the system. Obviously, eight players came in, and four of them washed out almost totally. But, any class that includes Clements, Moten, Samarco and Marschall has to be seen as a success, especially as those guys actually complete their tenure at BG. It has to rank as our most productive recruiting class in the post-WVU era. It certainly contrasts well with, say, the 03-04 class and 04-05 class. Also, people often carry on about transfers. With that in mind, I think it is important to remember that both Nate Miller and Brian Moten--two of our three seniors and our only two All-MAC types--were both transfers. Other schools have used this effectively (like Kent) and we shouldn't reject it out of hand as Falcon fans--especially since we had two transfers sitting out here this year. Erik Marschall--Coming off injury he contributes effectively off the bench. Martin Samarco--2nd team All-MAC, legit D1 player. Finished career. Otis Polk--Can be a force in middle. Chris Knight--Performed very effectively in spots, has ability to be a good player. (Technically, he is a Dakich recruit). Joe Jakubowski--Quality player, good addition to the program. Dee Brown--Limited playing time, has potential. Scott Thomas--Strong performer off bench, has All-MAC ability. Dave Hackenberg has a really good column in The Blade today about the decision faced by Greg Christopher as it relates to the program. I think it puts the decision in the right context, which is to say that hockey is a very accomplished sport and has heritage at BG, but is something most schools like ours don't have. Here, AD Christopher talks about the challenges operating the hockey program for one year with its long term future in doubt. "Sure, that concerns me," Christopher said yesterday. "We understand the situation can't linger. We have to set a direction and move in that direction. But I hate for this to be viewed as a hockey issue. It's a budget issue. What we're going through is no different than any other department on campus. We've all developed future [business] models, from status quo to small trims to severe cuts. Thankfully, right now, we don't have to go over the edge of the cliff. We can absorb current cuts by spreading them over all sports." Dave Horger also interview Christopher and that 28 minute interview can be read here. Just a quick wrap up on the Creighton game. I'm really proud of our guys, in fact. As Coach Orr said after the game, it wasn't a winning result but it was a winning effort. The fact we went into their place and had two chances to win in the last minute is a true tribute to our team and their ability to "know how to win." Creighton might very well have been the best team we played all year, and we gave them all they could handle in a true road game. In the chart below, you can even see that we absorbed one second half run, but couldn't absorb two. Our Seniors really went out in style. Nate Miller had 22 points, and Daryl Clements had 19 points and 8 rebounds. Moten chipped in 12 points as well. We end at 19-14, our first winning season since Reimold and Almanson left, and of course won the regular season championship. It was a very good year to be a Falcon fan. No, we didn't get into the Big Dance, and our frustrations on that front continue. I do have big hopes, though, that Coach Orr is the man who can take us there, given time. We are on the right track. Thanks to everyone, from the coaches to the players, for the many hours of hard work it took to make this happen. Following your play this year was a gift to all of us, and I was privileged to watch. Sigh.....and it is over for another year. I hate this day most of all. It is now a long, long five months until it all starts up again. More later, but the Falcons lost a heartbreaking game to Creighton tonight after leading the heavily favored Blue Jays much of the way, sometimes by double digits. We took care of the ball, but eventually succumbed at the free throw line, where Creighton had a big edge. We shot well and rebounded well, and didn't turn the ball over, but the lack of field goal defense and Creighton's advantage at the line eventually brought our season to an end. Fittingly, all our seniors ended up in double figures. Right now, I'm out of town, on hotel wi-fi, and very tired. Good night. Elton Alexander urges new MAC Commish to GO! GO! Elton Alexander of the PD urges the new Commish to get started on basketball right away, with an eye toward how reform happened in his old conference, the OVC. The OVC Champ was in the play-in game, FWIW. Hopefully MAC presidents won't let the MAC drop to OVC levels before making a collective decision to improve the sport. Silly Season (1-2-3-4-5-6-7-8-9-10-11-12), football scheduling, spring schedule. This is an annual occurrence....some team in the MAC messes its scheduling up, and then comes begging for help, and the dominoes fall across the conference. This year, it was Miami, who scheduled a 13th game. I do not understand how this happens, I just don't. I can find you a first grader who can differentiate 12 from 13. I just think this makes us look like idiots. Maybe the new commissioner can hold a training seminar by watching Sesame Street. I'm sure it is more complicated than I think. At least, I hope it is. This year, Miami had to drop Colorado (we actually had this earlier). Colorado is apparently going to play Toledo the week they were supposed to host Boise. So, now the MAC is trying to find an opponent for Boise, and that appears to be BG, according to this story. Needless to say, it would be huge to get Boise in our place, and I am all in favor of it. Also, here is the spring practice schedule (courtesy AZZ.com). Team Clawson fires everything up on March 27th. Spring game is April 25 @ 2:30. Apparently, plans for a nighttime spring game have been scrapped. In a statement on BGSUfalcons.com, Greg Christopher says that BG will have a hockey team for the 2009-10 season, and that budget cuts will be spread across the entire athletic department. He told The Blade that "we are not out of the woods." In fact, no sport will be cut. The other interesting thing in the note is that he lets everyone know that the strategic plan for Athletics, which was completed two years ago, is no longer "sustainable." In the world of a university, that is a pretty significant statement, I think. I'm glad to see this work out this way. The unsettled feeling is not good long term, and I hope that we can come to some long-term closure and that our athletic department works as hard with doing more with less as American families are. The last two weeks have been a roller coaster for BGSU Athletics. The thrilling finish to the basketball season, with two regular season championships and two post-season berths, has captivated fans across the country. The current budget challenges for Intercollegiate Athletics have sparked equal passion and attention. I wanted to let you know that we will field all 18 of our sports teams for the 2009-10 school year. Athletics, like all BGSU colleges and departments, has been asked to meet new budget targets to help the University reduce an expected $6-$10 million budget shortfall for the 2010 fiscal year (the fiscal year that begins in July 2009). Over the last few weeks, we have developed various potential budget reduction models and studied their potential impact on our department. Rather than eliminating any sports, in the coming year budget cuts will be made throughout the athletics department. This will significantly affect all 18 of our sports and support areas. Fans may remember that two years ago we went through an extensive strategic planning process for the future of BGSU Athletics. Unfortunately, that plan is no longer sustainable given how the overall financial landscape has changed. In the coming months, we will focus on the budget direction for fiscal year 2011 and beyond. As we head into new budget territory, BGSU undoubtedly will face more tough choices concerning competitive Division 1 Athletics. We have heard the concerns raised by supporters of BGSU ice hockey and appreciate their passion for the program. We also recognize the significant role the Ice Arena plays in the Bowling Green community. We will work with Recreational Sports (which operates the arena) and the community to review the issues related to the facility and begin collaborating on the development of possible solutions. To further explain the challenges facing Intercollegiate Athletics, I will be answering questions in a special interview with Dave Horger from 88.1 FM in Bowling Green to answer as many fan and community questions as possible. Horger will air portions of the interview during his show from 6-9 a.m., this Thursday and Friday. The entire interview will be posted on our Website Friday morning. 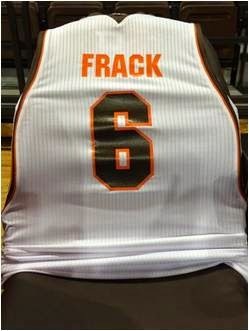 If you would like to add a question to the mix, visit the “Ask the AD” section at www.bgsufalcons.com. Finally, I thank all fans, students, alumni and community members for their passionate support of BGSU’s 425 student-athletes. BGSU is facing the same economic challenges as the rest of the nation. As a University, we are all working to ensure the long-term vitality of BGSU. Don't be ashamed...you might have had to look up where Creighton was. Its OK. They thought Bowling Green was in Kentucky. What they are is a very good basketball team. An NIT #1 seed, they were very close to an at-large berth in the tournament. They were 26-7 for the season, 15-2 at home, and won the MVC regular season championship. They are only hear because they ran into a buzzsaw in the tournament and got beaten by Illinois State. Speaking of which, they were 1-2 to Illinois State, a team that schooled us pretty good. On the other hand, that was early in the year. The Jays are led by Booker Woodfox, who is either MVC player of the year, or a member of the House of Lords. He averaged 15.9 points per game, but if that doesn't sound like a lot, remember he played only 25 minutes per game. He also shot 49% from beyond the arc. That is 3rd in the country, and better than some of our guys shoot from six inches away from the basket. Anyway, it is going to be a true test and a real victory for us if we can pull it off. Dana Altman is their coach, and, if you recall, he accepted the Arkansas job and returned to Omaha after reconsidering. They led their conference in scoring and points allowed. They were the third best shooting team in the conference and also allowed third on FG% defense. They force turnovers on about 24% of their opponent's possessions. As mentioned, Creighton plays with lots of depth. They are just a few seconds from having 11 players averaging 10 minutes a game. They have two players who are 6'9", but they aren't a huge team. To beat Creighton, BG is going to have to play a very complete game. We are a very good road team, and I hope we're not going to be intimidated in their gym. We are going to have to defend like crazy, make our shots, protect the boards and not turn the ball over. This is March Madness...the time of upsets. It will certainly be one if we win, but why not? We just need to play our complete game on both ends of the floor. One thing I am certain of...we won't win without our best effort. 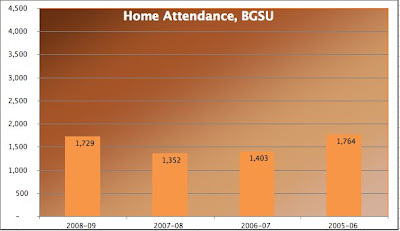 To start with, losing Hockey at BG would be an absolute tragedy. Although I do not anymore, I spent many happy hours in the Ice Arena, and I think hockey is a part of the University's identity. I would be very happy if hockey at BG was saved. I also know that we are in times when you can't always keep everything that is part of your identity. I know people who have had to close businesses they have spent their lives building. That's a tragedy, too. People losing jobs just a year or two from retirement. That's a tragedy, too. Good people losing homes, even those who had mortgages they could afford--isn't that part of your identity? That's a tragedy, too. I just think that lost inside the strong emotional arguments about the hockey program is a lack of recognition that we are in deep, deep trouble...and we haven't gotten to the bottom yet. If it has been 80 years since things have been this bad, we need to be prepared to take some steps we never might have considered before. Until proven otherwise, I believe this is a situation with no good options. If there are, I am ready to hear about them. With that in mind, some questions. 1. If you don't think that the Athletic Director and the President are doing this because they believe it is absolutely necessary, what other possible motivation could they have? What possible reason would they have for enduring this kind of controversy for something they didn't think was 100% necessary? 2. Can you acknowledge that there are severe and unprecedented pressures on the university's finances that have caused the once unthinkable to become thinkable? If you do, then do you have any ideas on how the university can maintain a hockey program and also answer the budget challenges? Follow up: Yes, I know you have asked for a bunch of budget information from the athletic department and you either haven't gotten it or think there is something they aren't showing you. Here's the deal. If they are talking about dropping a program, that's not the kind of budget gap you close by making fewer photocopies. We're talking strategic cuts, not tactical ones. If there are other ways to close the gap, they are going to be similar in scope. So what are your ideas? Follow up #2: If you say dropping to I-AA football, I do think that a case can be made for that. That wouldn't be my preference. I do not think it is a realistic step for the university to take. 3. Can you accept that the current economic conditions (and impact on the university) could not have been anticipated when the university raised money to renovate the Ice Arena? 4. If the choice is between keeping hockey on a starvation diet and dropping hockey, which would you choose? 5. A financial issue for the University is a tuition freeze. Do you believe that keeping tuition affordable for the students who come to BG--who are disproportionally more likely to be the first ones in their family to attend college--is more important than athletics? Here is the blog poll, CBS Sports, powered by blogs....I finished runner-up for Mr. Bold. So, if the winner can't fulfill his responsibilities, it is ALL ME. Dr. Jon Steinbrecher is the new Commissioner of the Mid American Conference. Prior to this, he was Commissioner of the Ohio Valley Conference...and prior to that of the Mid-Continent/Summit conference. I don't like it when we people don't use the H in John. He has a PhD? (Pssst...it is in Phys Ed). He doesn't come from conferences with a D1-A football tradition, so I wonder what that means. Other than that, he should get to work. There is lots to do. First, at the Q Friday I sat behind him for the first time...usually I sit across from him. He's a lot more animated on the bench than I had perceived. Now, he's not Dan Dakich animated, but he is more animated than I thought. Frustration shows through, and he even works the officials, though he usually does it politely, without gesturing or even looking at the official. After the game, he was walking off the court with George Jackson, and he was talking with a lot of animation, I assume about what had happened in the game or what we needed to have happen. Second, I found this interesting link....apparently, Rick Pitino left his honeymoon to recruit Coach Orr. Insert your own jokes. Dropped Out: Illinois (#17), Louisiana St. (#24). Wednesday night, 8pm (ET) in Omaha, the Falcons will take on Creighton in the first round of the NIT. I like this matchup much better than playing a worn out and bored Big 10 team like Penn State. Creighton was a true bubble team that probably lost its slot to some of the conference upsets (like Cleveland State). They are a number 1 seed in the NIT, and BG is a #8, which is as low as they go. They were 26-7 with an RPI of 40...and are probably the best team we have played since the OSU game. But, on the other hand, Creighton is a mid-major team with the MVC player of the year, a guy who shot 49% from beyond the arc. It is an excellent test for us, and against a team that I truly think will be working hard to win the NIT and set the stage for future success. Akron draws a really tough assignment, having to go all the way out to Portland and play Gonzaga. I hate Gonzaga as much as the next guy...I think they are arrogant and a little overrated. And, ordinarily, due for a taste of their own medicine. But that's a nice set up for them, being relatively close to home, and in the same time zone. I'll be rooting for Akron to break the MAC's losing streak, which has spanned 5-years. A #13 seed is certainly fair. And...Jay Bilas is a tool. Women go for another title at 1PM!! I only follow men's basketball and football on this blog, just because that's all I can do. But, our women's team is a true picture of excellence, and they are playing Ball State for YET ANOTHER MAC title. Tip off is at 1PM, on Fox Sports Ohio. Root the women on! Nate made the all-tournament team, which is well deserved. He set career highs in scoring in both games. Further, in the semi-final he made 5 threes, and his previous career high was 3. Congratulations to Nate. Apparently, Coach Dambrot was effusive in his praise of Nate, even going to far as to talk about how hard he had recruited him. The NIT field will be set at 9 PM tonight, on ESPNU. We should know shortly afterward who the opponent will be. That's quite a run. I believe they are the first team to win without a bye under this format. They were playing with great confidence in the last three games, and they were clearly the best team in the tournament this weekend. I hope they can break the MAC's losing streak and make a little Big Dance run, though I am doubtful. It will be interesting to see their seed. A #14 would not shock me. So, I got home about 3 AM last night, and then had some work to do this morning and when I got home it was nap time for a little while. Now, back at the keyboard, it has been approximately 18 hours since the Akron game ended, and it is still just a shame it had to end that way. What brought the Falcons down was something that caused it problems from time to time throughout the season--going long periods of time without scoring consistently. This was a problem in the second Akron game at the JAR...BG had six points with about six minutes LEFT in the first half. In that game, the Falcons finished hard and actually led at the half, erasing a 10-point deficit in those last six minutes. Last night at the Q, it was Akron who finished hard up to halftime, heading into the locker room with an 11 point lead. 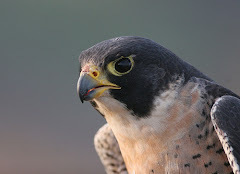 The Falcons are tremendously resilient though, and came out strong in the second half. It seemed like we got it down to six a few times, but couldn't get it closer, but we kept playing and actually led by three just inside 8:00 to go. It seemed like we spent all our energy getting that far, in the last eight minutes they scored 23 points (wow!) to our 12, and that was all there was to that. Bowling Green shot 20% in the first half from the field with no threes to dig the hole they were in, and even though we shot 44% in the second half and had 38 points, it just wasn't enough. If you want a turning point, with a little over four minutes left, Akron had a three point lead and missed a free throw. For a second, you could feel some energy, because the game was still within a possession. But the rebound went out to Akron, and McNees drained a 3 and all of a sudden it was a six point deficit. Akron got a stop and another basket to be up 8 with about 3 left, and the die was cast for the game ending script. (Speaking of McNees, you have to give him credit. Humpty Hitchens has been carrying this team, but he's injured, and they slot this McNees guy in, and he plays a very competent game at the point). As you can see below, Akron dominated most facets of the game. They shot better than we like teams to, especially from 3, and they killed us on the boards, along with making the most out of a lot of free throw attempts. Nate Miller ended the game with a career high 27 points, which is impressive on its own, but even more impressive when you consider that he was the only Falcon consistently scoring, and Akron knew it. We only had 55 for the whole game, making Nate nearly half of our offense. He had 25 of our 38 in the second half---again, without the element of surprise. They weren't letting him drive, and he switched his game and started to hit from the outside. There is no reason to name names, except to say that everyone else's shooting was pretty dreadful. We missed lots of zero footers, and shot some serious bricks from the field, too. Akron really struggled with the 2-3 in our second meeting, and we have been playing some killer D out of that, but in the first half they showed that they are a team that can adapt and learn, as they attacked the zone and scored pretty consistently against it. 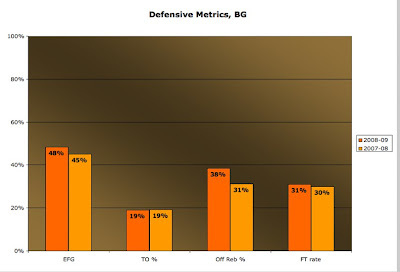 In the second half, BG went man-to-man, which was no more effective in the end analysis. Our guys really played hard, and they were clearly crushed when they left the floor. A couple thoughts on that. First, Akron is a good team. Brett McKnight is going to be a very good MAC player, Linhart has some skills and Chris McKnight was also very tough on the inside. Dambrot is a good coach and this is a good program. I'm not sure how their record wasn't better than it was, but Akron is a very solid MAC team. Second, I think all Falcon fans should be very proud of the success our team had this year. We are only two years removed from a period where we were 7--27 over two years in MAC play, and for this team to compete as we did was pretty impressive. I think it might have taken the fans as long as it did the players to get used to what kind of game we were going to play, but I do think the Nation learned to appreciate our style. As I always say, my favorite style of basketball is winning. I would be tempted to root for Akron, but a bunch of their fans ran into the bathroom after the game and taunted some BG fans, so I'll be rooting for Buffalo. As I wrote earlier, despite the end to the season, I am very proud of our team and how we progressed this year, and I give all of them credit for the hard work and perseverance it took to get them this far. It was an enjoyable season. PS--I know there is an NIT game left, and that's a nice honor and reward for our guys. Still, the main season--and the goals we started with--have come to an end. Hey, thinks to AZZ.com for the link to this excellent story by Matt Sussman in the Toledo Free Press about Loren Hargrove, who was falsely accused in a drug situation with a former teammate. I'm glad he is getting to tell his story, and I'm sorry that he has to work so hard to clear his name. If you are curious, here was my post when he was cleared of the charges. The Gund continued to be a house of horrors for the Falcons. More later. But, a huge hand for our Falcons for a great season, despite the loss last night. You gave us lots to cheer for. I guess I missed that Humpty Hitchens only played four minutes last night due to an ankle injury, and the inference here is that he won't play tonight either. They won last night without him. The issue really gets to be stamina. They played Sunday, Tuesday, Thursday, and then tonight, and with one less body, can they keep it up through the game. So, it will be the Akron Zips in the semi-final tonight at the Q. Looking very forward to tonight's contest, and I plan to be in attendance. Let's take a look at our two previous contests with Akron....we split with them, with both teams winning on the road. While the game at Anderson ended up with a 10 point deficit, it was a pretty closely fought game that BG held the advantage on in many areas....but we shot 28% and that was the difference in the game. 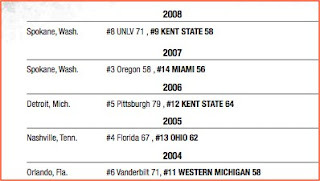 That first game occurred in the roughest part of the MAC schedule for BG. By the second time we played at the JAR, things were going better for the Falcons and the Falcons pulled out a pretty huge road win, aided by a miracle three by Brian Moten when it was beginning to look like we couldn't even get the ball inbounds. In that game, the shooting issues were reversed, as BG shot 42% and Akron shot only 30%. So, what can we expect tonight that might be different. Both games were close the whole way. I would expect that again. 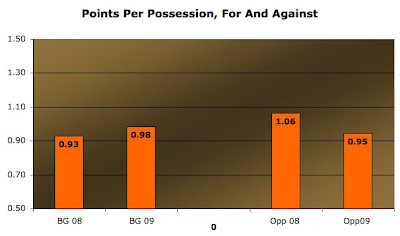 However, if BG shoots 60% as it has the last two games, then it is almost impossible to imagine that we can lose. Akron is obviously playing well. They fought back to win a tough game against Toledo, and then defeated a good, though short-handed Miami team last night. They are playing their fourth game in six days, which is not easy, and they had the late game last night, which is also the harder road to walk. But, they are well coached, have good players, and an emerging star in Humpty Hitchens. Should be a good one. It is appropriate to pause and recognize that we are experiencing tough times in this country. Bowling Green is feeling the pressure, and that has caused a firestorm of rumors and speculation about the fate of our hockey program. Today, that all spilled onto the pages of the Blade. Although no one at the University has anything too definitive to say, if you read between the lines of the quotes below, you get the sense that something is probably going on. "Hockey is important to the community, to the alums, and to the university," he [AD Greg Christopher] said. "But we've been told that we are going to have less finances to work with next year, and again in the following year, so we've put together various budget models, and sometime later we'll have to make a decision on what we will do." "Given our current financial situation, some cuts to programs and services will be necessary," Mr. Kielmeyer said. I have written here many times that I do not know how long Division I-A football, Division I basketball and Division I hockey are sustainable. You don't see very many schools our size do it successfully. In the MAC, only BG, WMU and Miami are also fielding D-1 hockey programs. The most successful college hockey programs are either at major colleges, or at colleges where hockey is the top sport. Heck, I have doubts about our ability to sustain D-1A football and D-1 basketball--forget about hockey. No doubt, losing hockey would be a serious blow to the history of the university, and the Falcon players who are quoted in The Blade story are making good points. I do object to this idea that "transient" administrators are performing a "drive-by" shooting on hockey. These are tough times and unpopular decisions may have to be made, but they are good people. They are not infallible--nor is anyone else--but I think to suggest they are doing anything BUT act in the best interests of the university isn't fair. Obviously, BG will have to eventually announce what it plans to do. I wonder if they have considered a Division II hockey program to reduce costs. One advantage to that would be if the situation turns around in the future, you could always climb back into Division I, and you would be making sure of your ice facility. It is the Zips.......more later in the way of a preview, but for now, let's just admit this to ourselves. After the 7 times Miami has knocked us out of the MAC tourney, the presence of the evil genius Charlie Coles (just joking about the evil part) and the voodoo hold they seem to have us under in all sports, the Falcon Nation breathed a sigh of relief that it won't be the RedHawks tonight. No disrespect to Akron, a team that clearly is playing well. It will be a tough game. But, all things considered, there's less of a psychic element to it. Matt Austin, a WR from Mt. San Antonio JC, which is in Walnut Hills, CA. They have JC water polo, which I have not heard of before. 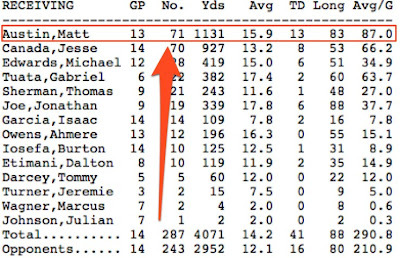 Austin was a very productive player in Junior College. He caught 71 passes his sophomore year for 1,131 yards and 13 touchdowns. He is 6'4", which is obviously a really nice size for a MAC WR. I hope he can provide immediate help for us at WR. The last time the Falcons won in the Q was 2002...and you might think we've had better teams before, but this team is playing pretty well right now, executing on both ends of the floor. We are playing as well as anyone in the MAC right now. The leader on that score is Nate Miller, who seems to raise his game from night to night. In the Q, he scored 22 points, a career high, and shot 9-11 from the field and added 10 rebounds and a steal. It was his best performance of the season, and he is finishing his season at his best. The Falcons also got some production from a couple of unlikely sources. For example, Erik Marschall had 11 points and 4 rebounds in 22 minutes. It is his first double digit MAC game. And, Chris Knight was back, and he had 7 points and two rebounds in 8 minutes of play. Finally, while Jakubowski only scored once, he put 8 assists on top of 2 turnovers, and that's a pretty good night. If you boil the game down, the dynamics are not that different from the game on Sunday. BG shot 60%, just as they did Sunday, and while OU didn't shoot 28%, they did shoot 37% and that was good enough. The score would have even been more lopsided, but BG turned the ball over 15 times and OU turned it over 7 times. 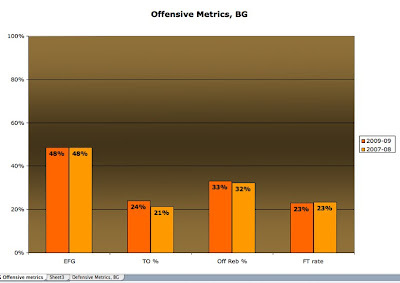 Finally, OU only shot 56% from the line, and BG hit 73% and had a +8 advantage on free throws. The game was tied 10-10, and then the Falcons went running away with it from there, and OU never led at any point. OU made a nice little run in the first half, but Clements hit a late shot near the buzzer, and then the Falcons came out on fire in the second half, and that was the ball game. Coach Jackson was great in the post-game. Todd Walker asked him about beating OU three times, and Coach Jackson said he didn't believe in that. "We beat them one game a time," he said. "And if we played them again, I'd want to beat them a fourth time." I continue to be cautiously optimistic about our team. It is all tough from here on in, but we've got as good a shot as anyone to win this thing. I think we are playing with confidence and execution, and we are really exemplifying a team concept. 1. Every Falcon fan knows that we have never won the tournament. We did, however, finish with a win ONE time. What were the circumstances to that? In 1982 there was a consolation game, and BG beat WMU, thus ending the tournament with a win. 2. Bowling Green has been in the final three times--who are our other (non-OU) losses. 3. If a Falcon fan went into a coma in 1979 and woke up today, and you explained the MAC tournament to him and asked him what team has knocked BG out the most, he would, without hesitation, say "Miami." And he would be right (7). Who has knocked BG out the second most times? 4. BG is 17-26 in the tourney (remember it is impossible to lose more than once every year). How many of those twenty-six losses were to lower-seeded teams? 5. Qualification in the MAC tourney is automatic now, but it was not always so. How many times has Bowling Green failed to make the tournament at all. 3, the same number of finals we have been in. 6. When was our last MAC tourney win? In 2005, we defeated BSU 75-73 at Anderson Arena, in a game where two Falcons committed misdemeanor assault as Ball had a shot to win the game. Allegedly. I know one thing that would be great would be to get a healthy and productive Chris Knight to add a boost to an already good team. According to Elton Alexander in the PD, he is expected back for tonight, but I guess time will tell. Actually, the article is pretty interesting in that it is 10 reasons why BG might or might not get a sweep (men's and women's) in Cleveland. Note that Coach Orr was Coach of the Year, and Curt Miller was co-Coach of the Year. Since we just played OU, I'm not going to do a new preview. Click back here...everything I said then still applies. As for this game, I think there a few dynamics. First, OU's Coach was hot about the performance of his starters, who he essentially benched when we played last time. Head coach John Groce was infuriated by what he saw from his starting five in a loss Sunday at Bowling Green. Groce benched his starters early in the second; none of the five played more than 25 minutes, and he promised there was no guarantee any of the starters—including his three seniors—would be in the lineup when the Bobcats began MAC tournament play. Yet, seniors Michael Allen, Justin Orr and Jerome Tillman all started against Western Michigan. I am pretty sure of this--it won't be like the last time. This will be a win we need to grind out. I think OU has something to prove and what happened last time will not happen again. That being said, we didn't NEED 75 points to win on Sunday. They have yet to solve our 2-3 zone, and if we keep playing the kind of defense we played on Sunday and have been playing, we are a difficult team to beat, even if we don't shoot 60%. We showed against Akron and Kent that we can take a blow, and still win games. So, even if OU comes out with a big early burst of energy, I think we have shown the ability to keep it close and, as Coach says, grind it out. OU is the ninth seed, and we were first, but we remember what happened the last time those two coordinates meet at the Q. There may be a big difference between the seeds, but there is a relatively thin margin between us and them. This is a nice test for our team, in fact. I'm looking very forward to seeing how we do. OK, so I spent a little bit of time looking at the historic results of the MAC Tourney. Below, you will find some trivia questions, but first some thoughts. The tourney has been going on since 1980. Its home has included Crisler Arena, Cobo Hall, Savage Hall, some place in Rockford, the Seagate Convention Centre, Anderson Arena, and the Q. Regardless of the arena, Falcon fans are already aware that our history in this tournament is a sad tale of woe. We have never won it. We have sent some very talented teams into the abyss known as the MAC tournament, and all that the universe returned was shattered dreams. I want to recall what I feel are the two most heart-breaking moments. The first is one from my college days, 1983, before the birth of all of our players, and therefore ancient history. For that year, the MAC tournament was played entirely on home floors---no central site. The Falcons were the top seed, and were set to host the championship game. We were playing (wait for it) the OU Bobcats. Anderson Arena was a contentious place that night. OU had brought a large contingent of fans, accompanied by a small pep band. And OU dominated the play, slowing play and getting their increasingly obnoxious fans involved. Despite the golden opportunity of playing the MAC Championship at home, OU defeated the Falcons 59-56. It was a very disappointing night....because at Joe Louis Arena at the very same time, the Falcons were losing the CCHA Championship in overtime--missing a penalty shot in overtime, no less--and then failed to get an at-large bid to the NCAA Hockey tourney. Of course, for the hockey team, a national championship was ahead in the very next season. The basketball team has probably never gotten that close to the Big Dance again, and if not, only once. The other most disappointing moment will be faimilar to all of today's fans. In 2000, the top seeded Falcons lost in OT to the ninth seeded Miami Redwhatevertheyweres. Powered by a ridiculous half court shot, that game is in many ways more heartbreaking, because of the suddenness. It really was like getting your heart ripped out of your body. But the past is not our destiny. And with three wins, we can erase all that. And with that, let's look at some trivia questions. I'll leave this up until tomorrow about 5, feel free to post guesses in the comments. Answers up tomorrow. The remainder of the MAC award winners have been named. I kind of thought Tillman might win, but you can't argue with Bramos. Jones was the obvious choice as freshman of the year, and other two---uh, who knows? The mystery is over, and the first Falcon task at the Q will be to beat OU for the third time this season. Which they say is hard. Nothing is going to be easy. A conference with strong parity all season long showed it the first night, too. The #11 (NIU) and #12 (Sucky Rockets) almost beat Kent and Akron, respectively, and the OU game was technically an upset--the Cats were the 9 seed. It looks to be tournament basketball at its best. May the best team win. NCAA Tourney....someday (I hope soon), we will come off this list!! Even though we have had some very good basketball teams in the past 40 years, we have not, in that entire time, been to the NCAA Tournament. As most Falcon fans know, the last time was when a guy named Bill Fitch roamed the sidelines during his one season at BG. Anyway, courtesy of AZZ.com, here is the list as it stands today of teams that have longer dry spells than ours. Note--many teams have never been in the tourney, but joined D1 after 1968....they aren't counted. So, 14 teams including us, on a list that gets a little shorter every year. I posted a while back that co-DC Joe Trainer had left BGSU (after not really being here) to be the head coach at Rhode Island. The dominoes began to fall last week. Mike Elko has been named the new DC, according to this story. There's nothing from our end yet, so it isn't clear if he will be the DC, or share the DC duties with Shannon Morrison, as Trainer was going to do. Elko was preparing to be the DC at Tennessee-Chattanooga, where Russ Huesman is now the Head Coach. Huesman and Elko both worked for Clawson at Richmond, and Elko also worked with Clawson at Fordham. FWIW, Huesman is not happy about it. MAC Report Online has his take on the post-season awards. He picks Reggie Witherspoon as Coach of the year, which is a reasonable pick, even though I don't happen to agree with it. Here, Reggie takes a somewhat comical victory lap after being "named" Coach of the Year. So, no sooner do I put a post up saying that Coach Orr should be Coach of the Year then, you know, it turns out to be true. Congratulations to him....it is well deserved. His patient teaching clearly made a difference to this team as they evolved from the very depths to being a regular season champion. He is the third Falcon coach to win this honor, and, as I mentioned, also won it in the Big East. He (and his staff) have really accomplished a lot in two years, and it is nice to see it recognized. Just as exciting, Nate Miller was named to the MAC All-First team. This is also a big honor. I was starting to think that you might have a team get the #1 seed and not place any players onto the First Team....but Miller is well deserving of the honor. He carried this team on his back for many games. He plays way about his 6'4" height, and is deadly effective on the inside. He also led the MAC in steals. I'm really pleased for him. The year started out with a 3-game suspension, but he made the very best out of his second chance, just like you would want anyone to do. He was so proud yesterday when he was cutting the net down, and so was his Mom. Here's the rest of the team. It is hard to argue with too much. Scott Thomas should have been all-freshmen, but that's OK, he'll show 'em. First, with the win, Coach Orr should be the hands-down choice for MAC Coach of the Year. It will be the second time he has won that award, the first being at Seton Hall in the Big East. His performance in turning this program around has been impressive, and, in particular, the team's ability to finish strong this year is a terrific testament to his ability, and his staff's ability as well. Second, here's the bracket for the tournament. Bowling Green plays the OU-WMU winner at 7pm Thursday, and then plays the Miami-Akron/UT winner in the late game on Friday with a win. That whole "West gets the number 2 seed" thing actually gives Buffalo a slight advantage on that end of the draw, but in the end, it doesn't really matter. If you want to win the tournament, you have to go and be ready to beat the best opponents....in other words, sooner or later, we have to figure out how to beat Miami. Third, Jerome Tillman came into the game as the leading MAC scorer and rebounder. Yesterday, he had 1 point and 2 rebounds and played only 20 minutes. Coach Groce seemed to want to send a messasge, because his reserves logged lots of minutes in the game. I also forgot to mention that fan favorite Matt Karafa had 5 points in 2 minutes, which tranlates to 100 points per 40 minutes played. Oh yeah! Dropped Out: Dayton (#19), Purdue (#20).